Che Apalache is a four man string band based in Buenos Aires, with members from Argentina, Mexico and the United States. The group’s founder, Joe Troop (fiddle) is a North Carolinian multi-instrumentalist, singer-songwriter, and composer, who moved to Argentina in 2010 and began teaching bluegrass and old-timey music. 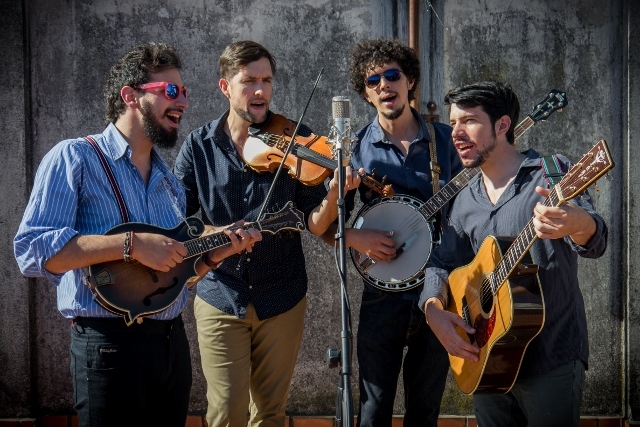 A natural chemistry developed with his most dedicated students, Pau Barjau (banjo), Franco Martino (guitar), and Martin Bobrik (mandolin), and in 2013 they formed Che Apalache. What began as a bluegrass band eventually evolved into an authentic blending of styles and geo-genres. Evoking images from Appalachia to the Andes, their debut album, “Latingrass”, is a testament to a powerful cultural and musical exchange. Click their video link to enjoy a sample of soul-satisfying sound and then we'll see you on the Music Meadow for Che Apalache.